Funeral services for Everett Arthur Eickhoff will be held at 2:00 P.M. Saturday September 15, 2018 at St John’s Lutheran Church in Wykoff with Pastor Michael Harmon officiating. Burial will be in the church cemetery. Visitation will be held 5-8 P.M. Friday September 14, 2018 at the Hindt-Hudek Funeral Home in Wykoff and will continue for 1 hr prior to the service on Saturday. 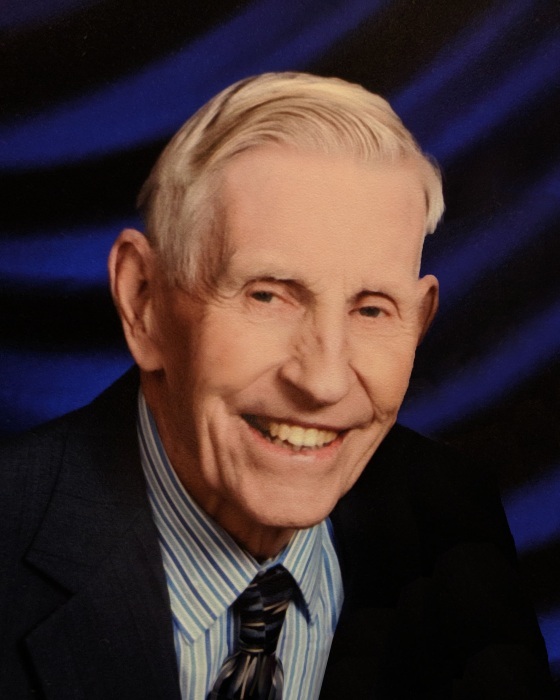 Everett Eickhoff, age 94, of Wykoff died Sunday September 9, 2018 at the Chosen Valley Care Center in Chatfield where he had resided for 3 ½ years. He was born February 17, 1924 in Fountain Twp., Fillmore County, MN to William and Sophia (Bicknese) Eickhoff. Everett attended country schools through the 7th grade, St John’s Parochial School for the 8th grade and graduated from Wykoff High School in 1941. In 1946 he joined the United States Navy spending one year in Adak, Alaska. He was discharged in 1947. On May 2, 1948 he was united in marriage to Beatrice Grabau at St John’s Lutheran Church in Wykoff and together they were blessed with 70 years together. He enjoyed spending time and being involved with his children, all of which live within 8 miles of the family farm. Everett farmed all his life and enjoyed traveling with his family and in later years with his wife. He especially enjoyed traveling to Alaska, Europe and China. He enjoyed his flowers, maintaining his farm and home, visiting with anyone, helping others and spending time with his grandchildren and great- grandchildren. He is survived by his wife Beatrice of Wykoff, children; Philip (Karen) Eickhoff of Fountain, Cynthia (Craig) Schultz of Wykoff, Kevin (Barb) Eickhoff of Fountain, Robert (Connie) Eickhoff of Fountain, and Leroy (Pam) Eickhoff of Wykoff, 9 grandchildren, 18 great-grandchildren, a sister-in-law Almeda Eickhoff, a brother –in-law Everett Grabau both of Spring Valley and many nieces and nephews. He was preceded in death by his parents, 4 brothers; Elmer, Edwin, Emil and Emery Eickhoff, 2 sisters; Linda Vehrenkamp and Lucille Schultz. Everett’s family would like to thank the staff of Chosen Valley Care Center for all the care and support given him and their family. Memorials are preferred to St John’s Lutheran Church in Wykoff or The Lutheran Hour.